Welcome to Dave's Shop Talk's Home Improvement Newsletter of questions from our members on their construction projects, a Tip of the Month and a home remodeling article, both from our website at https://daveosborne.com. We are into our 11th year putting out this Newsletter. Dan and I would not be able to do this without your input every month. Thank you and keep the questions coming! Safety Tip: Maintain your power tools with care. Keep your power tools sharp, clean and lubricated. Wear safety glasses and dust masks. Use the power tool only when you are fit to operate a power tool, while not impaired. Ref: Electrical 1: Electrical Safety. Safety Tip: Keep your work area clean. Especially on table mounted power tools such as table saws, band saws, routers, etc. Clutter under foot is inviting an accident, a slight trip and a finger or hand can be cut or removed. Ref: Remodeling 16: How to Install a Prehung Door. My question is about the outside of my house. This year I have to replace the clad board due to being rotted. I have particle board with an R-value of 1 underneath. I am thinking about replacing the particle board with foam board. If I use foam Board (it has an R-value of 3) do I still use a tyvek wrap to seal everything up before I attach the clad board or am I way off base. What would be the correct way to do this. My house is small 36x24 outside. Yes, install the Tyvec, as usual. This stuff keeps rain out, but lets the wall breathe. You are right on base! In Cortez, CO one of my customers lives in a duplex were bedrooms of each unit are separated by a common wall. She can't use this bedroom because she can hear her neighbor's conversations as though they were in her room. The wall is 12' long and there are 2 electric outlets. What do you suggest I do to stop the sound from coming into her bedroom? Would adding 2 layers of 5/8" d/w solve this problem? I would suggest installing Z strips, acoustical strips, horizontally across the wall, then the two layers of drywall, alternating joints,vertically. These strips attach to the wall and the drywall attach to them, breaking the solid barrier. You should explain that even this will not stop the sound, only muffle it. I did this in an apt where a kitchen backed up against a bedroom. It only muffled the sound. I built a duplex for myself which had a double 2x4 wall separated by 1" spacing for the "party wall", with fibreglass insulation in both walls and 5/8" between the walls, with 5/8" on the outside of the walls. This was excellent for a sound barrier, my tenants said. If the client has room, another option is to put up a 2x4 wall separated by 1". Put another layer of 5/8" drywall on first then install the wall with another 1 or 2 layers of 5/8" drywall. The more drywall, the better. The separation is the key, though. For the electrical boxes, add box extensions and longer screws so you don't need to mess around with changing the original boxes. My wife decided that she wanted a new floor in our basement and when she was at home depot saw a product she likes. Its called "Allure" these are tiles that are 36" by 12 with a glue tab on all 4 sides. You probably know the product! My basement is cement with a normal humidity of close to 55% year round and a cold floor. I need something between cement and tile to reduce humidity and cold, what do you think? I am looking at a product called "DMX 1-Step designed for click flooring of at least 10mm, what is your opinion? Fernand. The reviews are not that great. In my opinion I would select a click together laminate flooring. Costco has the best quality I have ever seen for a fair price. Laminate flooring is well suited over concrete floors. You first roll out a 1/4" foam pad, tape the joints together and snap the laminate together on top of this foam, which acts as a vapour barrier as well as insulation. This is called a floating floor. Base around the room holds it in place. With DMX 1-STEP you can use 1/2" thick plywood with the same securing mechanism and patterning used for strip hardwood. The vinyl manufacturer's instructions for subfloor preparation should be followed so the plywood panel seams don't show through the finished flooring. They suggest this stuff to be used under click flooring which is laminate floor, not vinyl tile. Hello, Dave: We have a long rear wing on this old farmhouse and we are planning to build an addition onto the side. The wing is two stories in height and has a 4/12 standing seam metal roof. Obviously here in Maine we get quite a lot of snow and when the sun has worked on the roof a while the snow comes off in an avalanche! We do not want the snow to fall off the roof onto the roof of the new addition and I know I will need to use some sort of snow/ice rail or other snow diverter system to allow the snow to more gradually melt off the roof. So do you have a suggestion about which type of system might be best to use? 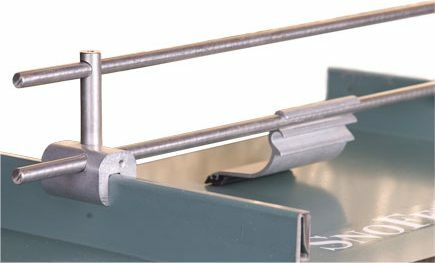 It comes with clamps for the standing seam and ice dams to keep the ice build up from sliding under the rails, as well. Thanks for the questions, this month, I hope the answers were helpful to you, as well.